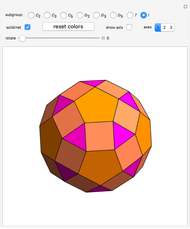 This Demonstration colors the faces of the small rhombicosidodecahedron to show the subgroups of the icosahedral rotational group. Faces that are (e.g.) blue land on another blue face when one of the group transformations is applied. P. R. Cromwell, Polyhedra, New York: Cambridge University Press, 1997 pp. 309–313. 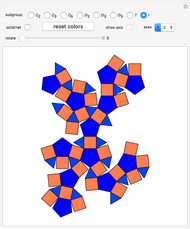 Izidor Hafner "Icosahedral Rotational Symmetry Types"